When it comes to purchasing a diesel truck, many people’s initial opinion on the matter can be easily clouded by black smoke. Sure, this is due to the fact that there are diesel truck drivers out there that enjoy “rolling coal” and leaving their fellow highway drivers in a trail of smoke, but this certainly isn’t the case for every diesel truck owner. Here at TxDC, our diesel shop in Dallas, Texas, it’s no secret that turbo-diesel engines are what make us tick. While we would love every truck driver to make the move to a diesel rig, we know it’s not necessarily in the cards or the right option for everyone’s needs. If you’re in the market for a new pickup and you’re stuck contemplating whether to choose gas or diesel as your truck of choice, the following are five factors to consider when going through the process of determining if going diesel is right for you. Turbo-diesel powertrains are naturally more expensive off the bat than your standard gas truck engine. That’s because the engine block is constructed to be heavier in order to handle higher combustion pressures, and they also come with an included turbocharger, beefed up transmission system to handle high torque output, and emissions controls. While all of these factors are incredible perks that add thrill to any ride compared to your standard stock engine, they do come for a pretty penny. Overall, it is safe to say that a diesel truck will lead to a higher initial investment, but with significantly better fuel economy and long lifespans, they are an excellent long-term investment if you’re planning on driving your diesel truck for years to come. As we stated, a turbo-diesel pickup will always have significantly improved fuel efficiency when compared to their gasoline-powered counterparts, but the gap is beginning to narrow with the newer gas truck models coming onto the market. As a whole, diesel maintenance and diesel repair costs can be higher than that of a gasser. As long as you choose the right diesel shop for your regular maintenance, though, you won’t have to dish out much more than you would for your standard truck maintenance. Most diesel repairs are more costly simply because the diesel parts like alternators, starters, water pumps, and batteries all cost more than the respective parts for gas engines. One item that most car buyers take into consideration when going about their search for a new vehicle is the resale value, and a truck is certainly no exception. If you plan on ever selling your truck in the future, a diesel truck will offer a much greater resale value than gas, especially if you’ve properly kept up with routine diesel maintenance and repairs or added extra aftermarket components to improve your diesel performance. What do you plan to use your truck for? We certainly hope that you don’t plan on having a truck just for the looks without ever loading up the bed or throwing a hitch on the back. If you do plan on towing, though, depending on the size of your load, a diesel might be the answer for you. While diesel trucks are heavier than gassers, maximum towing capacity is their forte. While towing across town can certainly be done with a gas truck, you’ll have an easier time with a diesel — especially if you plan on towing long distance, across mountain ranges, or in any other similar conditions. Not only do diesels have more torque, but they also have exhaust brakes, durability, and fuel efficiency to handle long hauls better than any other vehicles. On the other hand, if your main concern is simply payload for hauling around tools, then a gas truck could potentially be a better option for you as they are rated higher in this category due to having slightly better horsepower in most cases. So overall, if you’re looking mainly for power, go gas, but if you’re looking for torque, go the diesel route. 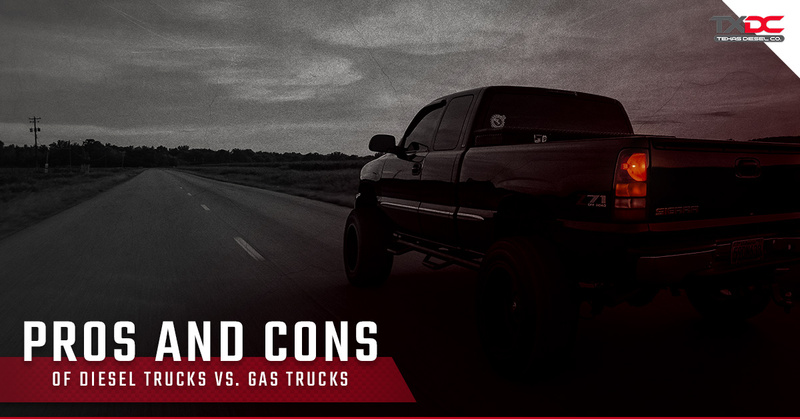 When it comes to diesel vs gas trucks, our first choice at Texas Diesel Company is always — you guessed it — diesel. With that being said, we hope that the factors discussed in this blog help you with making your difficult decision for your new truck. At the end of the day, you can’t lose! If you decide to join the diesel club or you currently have a diesel truck in the Dallas-Fort Worth area, schedule an appointment with our diesel shop for your next diesel performance or diesel repair needs. Our team of diesel mechanics at TxDC are here to help you keep your rig running at its best for years to come.